While Mecca Bingo is all about online bingo games, Mecca Bingo Mobile focuses more on offering mobile casino games to mobile phone users. More than 20 games are available inside (including mobile bingo), with a few iPhone games thrown into the mix as well. This mobile casino gives players free cash to try things out, so there’s no reason not to sign up. Unfortunately only players from UK, Ireland, Gibraltar, Sweden are allowed to play here. The games at Mecca Bingo Mobile are provided by IGT Mobile and Probability, and have been designed to be compatible with most mobile phones on the market today. A full list of compatible phones is available on the Mecca Bingo Mobile website, but basically anything except for Android phones and iPads will run the games. Recently, a small selection of iPhone compatible games has also been added – this will likely be expanded in the future. 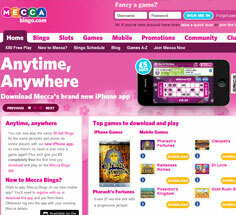 To play games at Mecca Bingo Mobile, members need to be from UK and can download them directly from the site. Mecca Bingo Mobile offers a wide range of mobile casino games, focusing mostly on mobile slots and instant play games, which are all great for enjoying on-the-go. Some of the best IGT games can be found inside, like Cluedo, Rainbow Riches, and Monopoly Multiplier. Other games include roulette, blackjack, video poker, and of course, bingo. 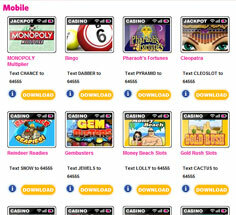 Players accessing Mecca Bingo Mobile on their iPhone or iPod Touch have access to smaller selection of exclusive games, including Cleopatra, Rainbow Riches, and Monopoly Multiplier. As with most mobile casinos that are part of larger online gambling sites, Mecca Bingo Mobile has little to offer in the way of bonuses. All new players can expect to receive up to £50 on their first deposit. 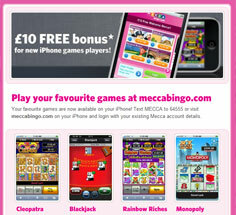 Mecca Bingo offers special recurring bonuses, and an absolutely incredible range of online bingo promotions. 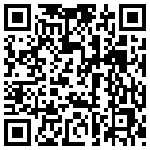 Mecca Bingo players looking for a mobile version of this award-winning bingo site won’t find it here. Instead, they will find a strong mobile casino, offering 22 great games from slots to blackjack, video poker, and more. A mobile bingo game is also included, and while it’s a far cry from the outstanding online bingo games that Mecca usually offers, it is one of the best mobile casino options out there. The only main drawback is that non-UK players won’t be able to enjoy this casino.